This post (written to you straight from a random classroom at Wenzao Ursuline College of Languages) will describe what a typical day in class is like for iEARN Taiwan students. Every Monday through Friday, we have Chinese class at the Center for Chinese Language (CCL) from 10-12, and this is where a lot of our Chinese learning takes place. It’s a small room with white walls, a slightly frightening really old window, and a door. Our current classroom, the same classroom where our Chinese was born at the very beginning of the year, has few tables facing the white board where the teacher stands. Our class has about seven students, four of which are me and my fellow NSLI-Y students. The small class sizes are ideal, and I really feel that I have developed good relationships with our teachers. Although the content of the textbook can seem very irrelevant and boring, not all of our time in class is spent on the textbook. Often, just having normal discussions with the teacher is the best way to learn new Chinese vocabulary and grammar. 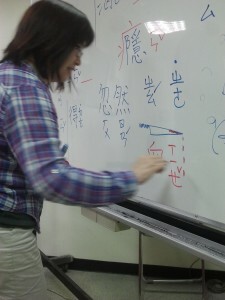 Here’s a fun picture of my favorite teacher, “the queen (女王), 姜老師.” Try to guess what we were learning in class today! I guess this post has just become a time for me to acknowledge how incredible our teacher is and how she has only ever used Chinese with us to get us from knowing literally no Chinese less than eight months ago, to the conversational little beings we are today. We will all forever be grateful to our queen!